Boeing shares slumped Monday on the company's weakened profit outlook after it announced last week it would cut production of 737 planes following two deadly crashes. Shares finished down 4.4 percent at $374.52, weighing on the Dow in the first session since Boeing announced late Friday it would trim production to 42 planes per month, down from 52 per month. The 737 MAX has been grounded worldwide after suffering two crashes in five months that killed nearly 350 people. The Federal Aviation Administration has signaled it will take a cautious approach before clearing the planes to resume operations. Bank of America Merill Lynch predicted the "disruption" to the 737 line would last six to nine months, up from the prior estimate of three to six months. The bank also trimmed its profit forecast for this year and over next four years. "Boeing could incur liabilities related to certification and testing costs, late delivery penalty to airlines, lives lost from the Ethiopian Airlines flight ET 302 and Lion Air flight JT 610, and production disruption penalties to suppliers," the note said. 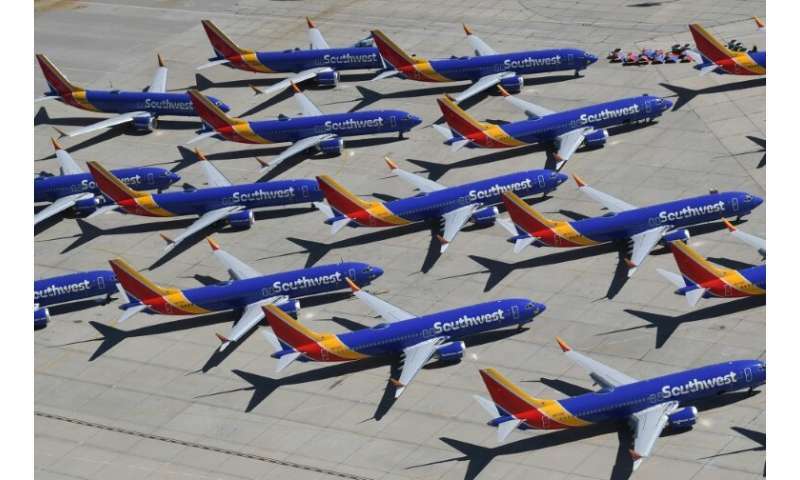 "The reputational loss from these events could erode long-term market share and pricing power of the 737 MAX," added the Bank of America note, which downgraded the rating to "neutral." Canacccord Genuity cut its price target on Boeing shares to $380 from $391.93 and said it now saw July 2019 as the date the MAX grounding could be lifted "in a best-case scenario." "After a relatively slow reaction by Boeing management to the Ethiopian Air accident, we believe Boeing is feeling much more regulatory and political pressure on the MAX than it anticipated," said the Canaccord Genuity note. Morningstar also said the announcement likely meant a longer grounding period, estimating that earnings would decline $1.11 per share. However, Morningstar said Boeing should be able to ramp up monthly production of the planes to 57 aircraft before hitting the mid-60s in the next decade. "We believe Boeing's ability to generate returns above its cost of capital will remain strong well into the next decade and most likely beyond," said Morningstar. CFRA Research maintained a "buy" rating on Boeing despite trimming the earnings estimate for 2019. Although the Boeing story will be "volatile" in next few months, the company should do well in time, it said. "Longer term, strong aerospace demand, Boeing's strong order book and backlog and track record of execution are likely to weigh out, we think," CFRA Research said. S&P Global Ratings said its rating was unaffected, writing that the company "has sufficient liquidity and cushion in the rating to weather the MAX grounding." S&P warned that deliveries in some markets could be delayed after regulators in the EU, Canada, China and elsewhere said they would review Boeing's fixes before allowing the planes to resume normal operations. These announcements break with a tradition of accepting the certification of the company's home regulator, in this case the US Federal Aviation Administration. But S&P said a canceled 737 MAX order by Indonesian carrier Garuda and a recent decision by China to order from Airbus were not signs of a new trend. "Order cancellations from other airlines are possible but this could be driven more by their growth prospects and financial condition," S&P said. "Airlines generally lose their deposits if they cancel orders and Airbus does not have the capacity to ramp up production significantly in the short term to replace canceled Boeing orders."